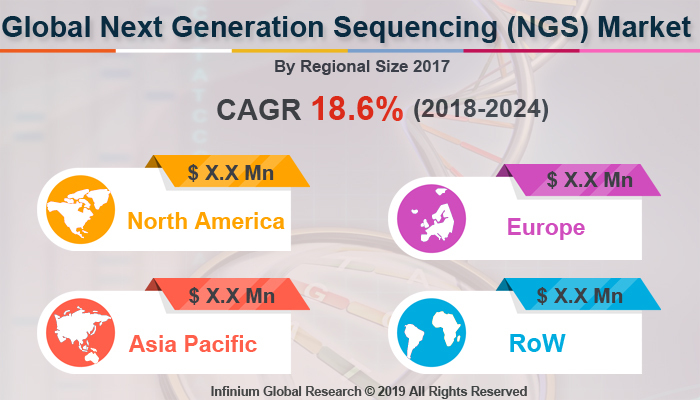 A recent report published by Infinium Global Research on next-generation sequencing (NGS) market provides in-depth analysis of segments and sub-segments in the global as well as regional next-generation sequencing (NGS) market. The study also highlights the impact of drivers, restraints, and macro indicators on the global and regional next-generation sequencing (NGS) market over the short term as well as long term. The report is a comprehensive presentation of trends, forecast and dollar values of global next-generation sequencing (NGS) market. According to the report, the global next-generation sequencing (NGS) market is projected to grow at a CAGR of 18.6% over the forecast period of 2018-2024. The next generation sequencing (NSG) is the term used to describe a DNA sequencing technology. This technology has revolutionized genomic research and enables the sequencing of thousands of DNA molecules simultaneously. Next-generation sequencing is also known as second generation sequencing or high-throughput sequencing. This technology enables sequencing of genomes at high speed and at low cost. NGS allows researchers to perform a wide variety of applications include Diagnostics, Biomarkers and Cancer, Reproductive Health, Personalized Medicine, Agriculture, and Animal Research and Others. The use of NGS-Based Diagnostic in medicine to improve diagnostic accuracy and reduce unnecessary healthcare costs. The advantages offered by the Next-Generation Sequencing (NGS) over other sequencing platforms are driving the growth of Next-Generation Sequencing (NGS) market worldwide. This technology enables the sequencing of a sample more quickly and cheaply as compared to other sequencing methods. Its applications in diagnosing illnesses such as hematological disorders, dysmorphology, cancer, and vision & hearing impairment fuel the market growth. Additionally, technological advancements in the field of sequencing are contributing to the growth of the next generation Sequencing market. The rapid adaption of NSG in healthcare for identification and curation is anticipated to boost the growth of the next-generation sequencing market over the forecast period. However, the less awareness about the DNA sequencing platforms in the developing region and lack of skilled expertise are restraining the growth next-generation sequencing market. Moreover, government organization is taking the initiative to promote Next-Generation Sequencing (NGS) in various applications that are projected to create numerous growth opportunities in this market. The ongoing research and developments in this sector are expected to escalate the growth of next-generation sequencing market in upcoming years. In terms of geographic, North America has led the next generation sequencing market. Factors such as accessibility of research funding, and growing uses of NGS in diagnostics and genomics research drives the growth of this market in the North America region. In addition, Asia Pacific is the fastest growing region in this market. The growing awareness about the DNA sequencing in the treatment of several conditions, growing geriatric population, and the rapidly improving healthcare infrastructure are the key aspects that are expected to create a huge demand for this market in the Asia Pacific region. The report on global next-generation sequencing (NGS) market covers segments such as product & services, technology, application, and end user. On the basis of product & services, the sub-markets include consumables, platforms, and services. On the basis of technology, the sub-markets include sequencing by synthesis, ion semiconductor sequencing, sequencing by ligation, pyrosequencing, single molecule real time sequencing, and other technologies. On the basis of application, the sub-markets include diagnostics, biomarkers and cancer, reproductive health, personalized medicine, agriculture and animal research, and others. On the basis of end user, the sub-markets include academic & government research institutes, pharmaceutical companies, biotechnology companies, and hospitals & clinics. The report provides profiles of the companies in the market such as DNASTAR, Eurofins Genomics, macrogen, PerkinElmer Inc., Thermo Fisher Scientific Inc., Agilent Technologies, Inc., F. Hoffmann-La Roche Ltd, Illumina Inc., Pacific Biosciences of California, Inc., and QIAGEN. The report provides deep insights into the demand forecasts, market trends, and micro and macro indicators. In addition, this report provides insights into the factors that are driving and restraining the growth in this market. Moreover, The IGR-Growth Matrix analysis given in the report brings an insight into the investment areas that existing or new market players can consider. The report provides insights into the market using analytical tools such as Porter's five forces analysis and DRO analysis of next-generation sequencing (NGS) market. Moreover, the study highlights current market trends and provides forecast from 2018-2024. We also have highlighted future trends in the market that will affect the demand during the forecast period. Moreover, the competitive analysis given in each regional market brings an insight into the market share of the leading players.